The Legends Classic began its 10th season on Saturday as Notre Dame earned an 89-64 victory over Bryant. 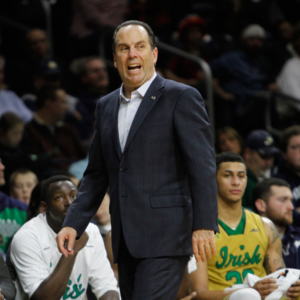 The Fighting Irish were led by Bonzie Colson, who posted 23 points and nine rebounds. V.J. Beachem tallied 22 points and Steve Vasturia had 16 points. As a team, Notre Dame shot 30-of-61 from the field and turned the ball over only three times. Bryant was paced by Nisre Zouzoua’s 19-point effort. Sebastian Townes had 16 points, Adam Grant scored 13 points, and Dan Garvin had four points ad a game-best 12 rebounds. The Legends Classic continues on Monday when Texas hosts Louisiana-Monroe in an 8:00pm (ET) tip on The Longhorn Network, Seattle travels to Colorado for a 9:00pm (ET) start on the Pac-12 Network, and Northwestern is home to Eastern Washington in a 9:00pm (ET) tip on the Big Ten Network.